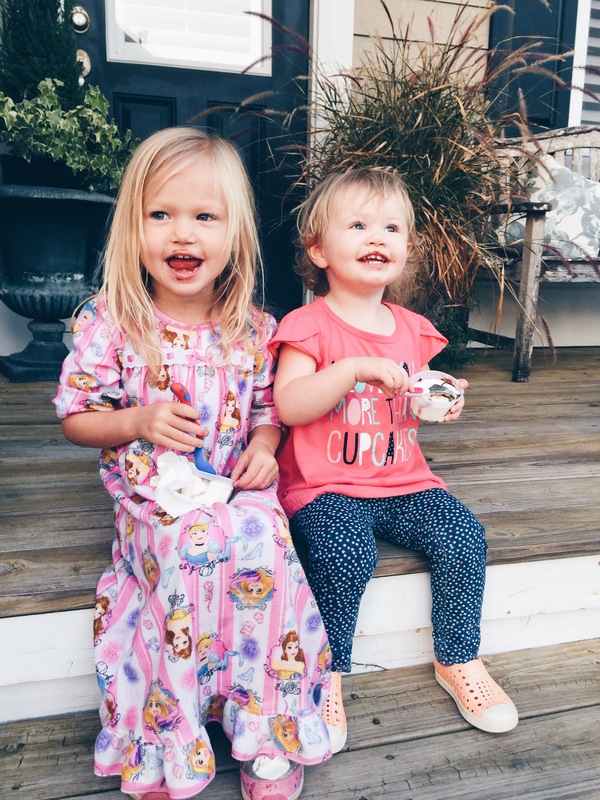 Beckett Boutique | King Street, Charleston, SC » Welcome to the jungle- Urban Safari for the win! Welcome to the jungle- Urban Safari for the win! I try to find ideas for my blog posts from my everyday life. What inspires me, what are my style goals, what exotic places do I want to visit…BAM!!! (snap back into reality). My fashionable daydreams are constantly interrupted with “Mommy, Mom, Mummy, Mumm” ringing in the background of every thought. But fear not, I will not let the less-than-glamorous life of a Mom stop me from coming up with creative content for you, my lovely readers. Thank you children (B & V) for demanding to watch multiple episodes of The Lion Guard last Saturday while singing “Hakuna Matata” over and over. Viola, the Urban Safari blog topic was born! I often struggle this time of year with what to wear as seasons transition from Winter to Spring. Stores are filled with new Spring styes, and I am beyond tired of my winter frocks, so how do I dress current and new without looking like I’m 2 months too early for spring break? Answer: this season’s Urban Safari trend. Focusing on neutrals like army green, khaki, denim, & white, while mixing in tribal prints and stripes, makes this the perfect trend for a seamless transition into Spring. The beauty of this adventure seeking inspiration is that most of us already own key pieces to create a killer safari look, but finding great styles within this genre is easy too. It’s all about how you put them together to achieve the layered Safari look with a little Urban edge. Denim is a must, and if you don’t already have at least 2 great pairs of jeans, please come to Beckett immediately, we can help you! Vests are also key for nailing this trend, and since we are still in Winter months, a vest can help layer on the warmth too. 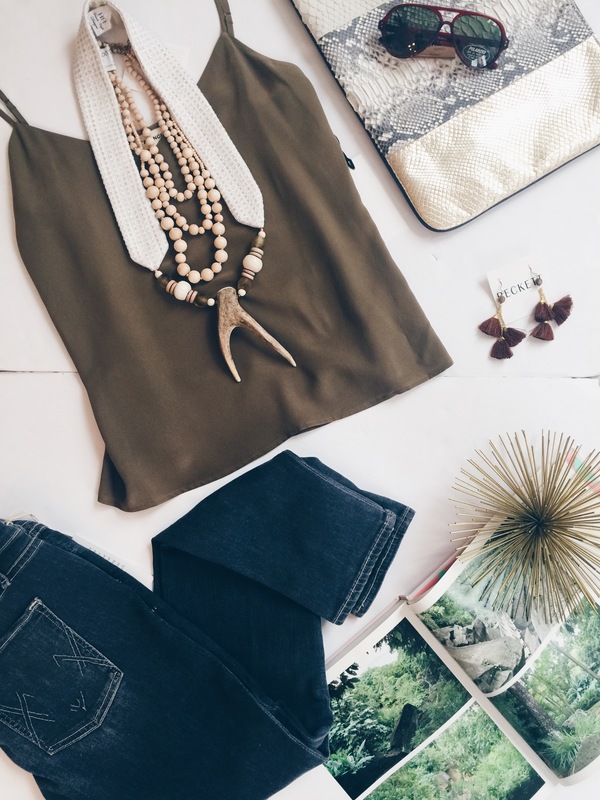 Go through your closet and pull out anything army green, tan, white, or cream – these colors can be layered together to create a jungle palette that is both neutral and polished with a hint of safari. Finally, you must, must, must find a pop of tribal to inject some personality into your ensemble. Accessories are a great and usually inexpensive way to set your look off! It’s a jungle out there – so go for the kill with these amazing looks (modeled by some fab Beckett Babes)! 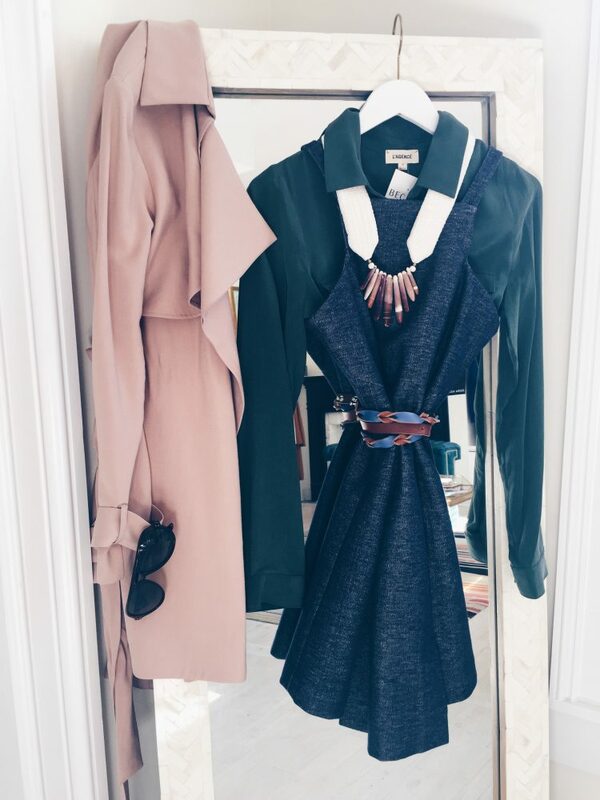 Chic, polished, & fashionably on point! 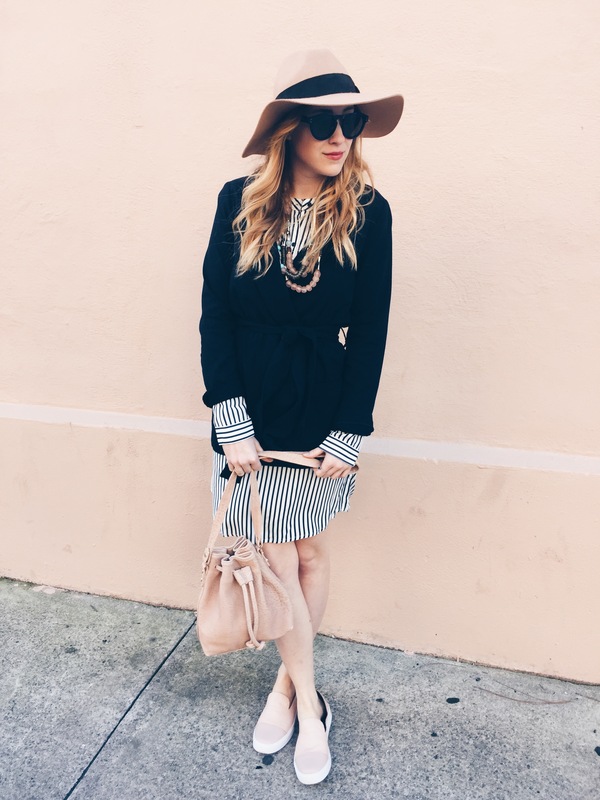 Floppy hat, stripes, blush tones, yes please! 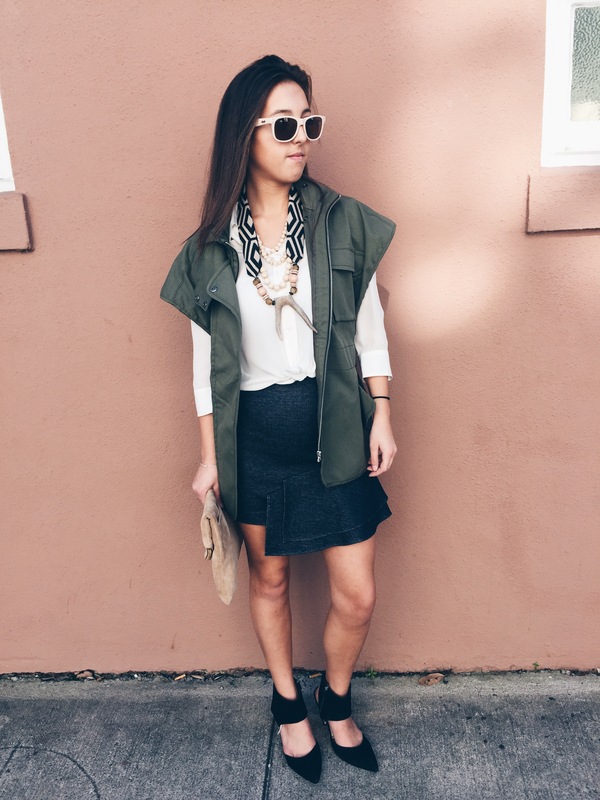 This vest IS Urban Safari to the extreme. A must have for sure. While you may not be going on an African Safari anytime soon, you can definitely channel your inner adventure seeker and try this trend. For more Urban Safari style tips, come by Beckett and one of our amazing Beckett Babes can create the perfect look just for you!